An unexplained series of mishaps and accidents have beset the good people of Bricksburg. Missing children and livestock, spoiled milk swirled with blood, stillborn calves, and other calamities have dogged the community for weeks, and the trouble seems to be getting worse. Some believe the town has been cursed, attracted malevolent spirits, or has somehow angered the small gods of the nearby hills. No one knows for certain and panic has started to tighten its grip on the hearts and minds of the townspeople. Something must be done, but no one has the courage to confront the evil lurking in their midst. 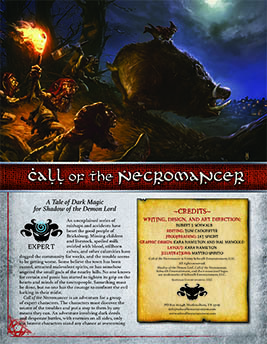 Call of the Necromancer is an adventure for a group of expert characters. The characters must discover the source of the troubles and put a stop to them by any means they can. An adventure involving dark deeds and desperate battles, with enemies on all sides, only the bravest characters stand any chance at overcoming the evil at work in Bricksburg. Pick up your copy today from Schwalb Entertainment or DriveThruRPG! A fearsome drought has come to the Grand Duchy, leaving fields barren and dusty, towns abandoned, and people pushed to the desperate brink of starvation and thirst. In the midst of the perils the unseasonable heat has brought to these lands, hidden enemies have chosen this time to hatch their vile conspiracy. 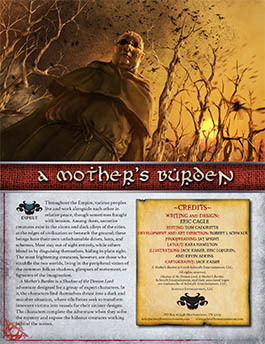 Written by veteran game designer and writer, Eric Cagle, A Mother’s Burden presents a gruesome challenge and an unspeakable revelation for a group of expert characters. Grab your copy today from Schwalb Entertainment or DriveThruRPG! Welcome to Disciples of the Demon Lord! This new program offers a digital platform for people to create adventures for Shadow of the Demon Lord. Have a great adventure idea? You can now publish it. Everything you need to produce the adventure is available at DriveThruRPG. With the tools we have provided, you can unleash the full horror of your creativity onto the world. We’re thrilled to open up Shadow of the Demon Lord to the community who has embraced the game. And, we can’t wait to see what you come up with to speed Urth to its end. You can find out more information about the Disciples program here and here. The first releases for the Disciples of the Demon Lord program include Salt and Sacrifice by Jerry LeNeave and Ben Menard, a tight light adventure that features carnivorous fish people and human sacrifice. Also, we have Cold Wind to Valhalla by Nat Webb, an investigation into the murder of a notable citizen. Going with the release, Webb has also dropped the City of Lorden Gazetteer, which details the city. The Demon Lord’s shadow looms over Urth, growing stronger each passing day with every terrible deed and sacrifice that is performed in his name. As winter falls across the lands, old legends stirred by the Shadow come to life once more. Ancient evils that few remember rise again to resume their nocturnal wanderings, spreading darkness, suffering, and death wherever they roam. Written for a group of expert characters, He Sees You While You’re Sleeping is set in the small village of Hund, where a terrible monster threatens those among them who are the most vulnerable: their children. A fledgling cult has taken root in an abandoned asylum just outside the settlement, engaging in vile and dark magic to harness the essence of a horrific demon called the Krampus: a malevolent entity infamous for hunting, terrorizing, and killing children all across Rûl. The group adventure ends when the group defeats the Krampus or at the toll of midnight on Krampusnacht, which is the beginning of the winter solstice. Buy He Sees You While You’re Sleeping from Schwalb Entertainment or DriveThruRPG today! The Queen of Gold presents eleven connected adventures that form a complete campaign. You can run the adventures in the order they are presented in this book, or pick out the adventures you like most. Set in the world of Shadow of the Demon Lord, characters will rise from meager origins to the heights of power as they struggle with evils coming from beyond the world’s edge, a malevolence from which there is no escape. Like other adventures designed for Shadow, this campaign has no expectations for survival or even success, and it’s entirely possible for the group to be the catalyst that brings about the end of all things. But that’s how it goes when you’re standing before the maw of the endless Void that is about to consume the world—and everyone’s looking to you to stop it. Grab a copy of The Queen of Gold from Schwalb Entertainment or DriveThruRPG today! The small town of Flenfeld was a prosperous farm settlement, blessed with good weather and harvests bountiful enough to keep its folk fed most years. But when the characters discover the settlement deserted, with no obvious signs of strife or skullduggery, they find themselves caught up in the dark aftermath of an unspeakable horror. Flenfeld’s shrine to the New God was built upon the broken ruins of an ancient monastery, beneath which are secret catacombs and caverns long lost to memory. Deep within these forgotten chambers a diabolical evil has bided its time, and is now set to rise once more. Written for expert characters, the group completes the adventure when they defeat the evil that dwells beneath the shrine. 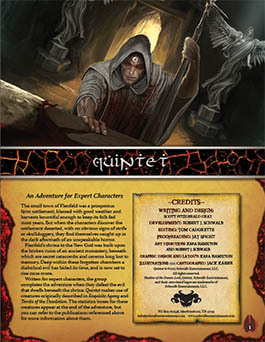 Quintet makes use of creatures originally described in Exquisite Agony and Tombs of the Desolation. The statistics boxes for these creatures appear at the end of the adventure, but you can refer to the publications referenced above for more information about them. Grab a copy from Schwalb Entertainment or DriveThruRPG today! The tiny fishing village of Rock Rump has only one claim to fame: its juicy and flavorful fried clams. This settlement near the Teeth is not much frequented, but those visitors who come always try the local fare. The annual Clam Fest is the highlight of the year, an opportunity for the village’s enterprising clammers to make impressive profits. But recently the Demon Lord’s shadow touched the clam beds, unleashing a terrible infestation that threatens the entire coast. 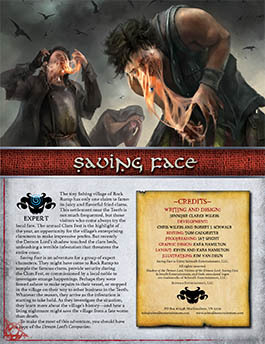 Saving Face is an adventure for a group of expert characters. They might have come to Rock Rump to sample the famous clams, provide security during the Clam Fest, or commissioned by a local noble to investigate strange happenings. Perhaps they were forced ashore to make repairs to their vessel, or stopped in the village on their way to other business in the Teeth. Whatever the reason, they arrive as the infestation is starting to take hold. As they investigate the situation, they learn more about the village’s history—and how a living nightmare might save the village from a fate worse than death. To make the most of this adventure, you should have a copy of the Demon Lord’s Companion. Buy Saving Face from Schwalb Entertainment or DriveThruRPG today! Terror in Freeport leads the group deeper into the intrigue first glimpsed in Death in Freeport. The investigation takes the characters from the corridors of power to the bowels of the underworld, and along the way they gain terrifying insights into who really controls the city: the Brotherhood of the Yellow Sign! Milton Drac, Freeport’s Sea Lord, hides his affiliation with the Brotherhood behind a veneer of respectability and executes his sinister plans via a network of ignorant flunkies. Since taking the position of Sea Lord after Anton Drac’s assassination, Milton Drac has used his power to push through the lighthouse project, nearly bankrupting the city to fund the construction of a new “world wonder.” What no one yet realizes is that the lighthouse’s construction is a crucial component in a horrific plot to summon forth the Unspeakable One. 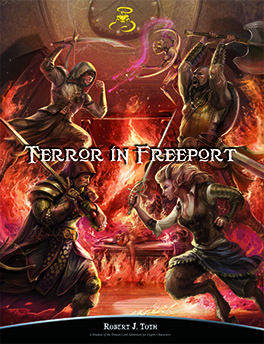 Buy Terror in Freeport in PDF from Schwalb Entertainment or DriveThruRPG! A print version is coming soon from DriveThruRPG! Trouble has come to the door of Bleak’s Faste, a stronghold built to protect the common peoples living in and around the Dark Forest. Beastmen have stepped up their attacks, raiding the trails and roads in a relentless assault that has kept the stronghold’s soldiers on the defensive. To make matters worse, the expected supplies from a nearby commune have yet to arrive; unless they come soon, the soldiers will become too hungry to keep the howling, cackling hordes at bay. Forbidden Fruits explores the mortal peril that the growing darkness poses to even the most virtuous of people. Anyone can be warped into debauchery and madness when they dwell in lands on which the shadow falls. The group completes this adventure by stopping the corrupted communers, preventing further infestation, and delivering the needed goods to Bleak’s Faste. 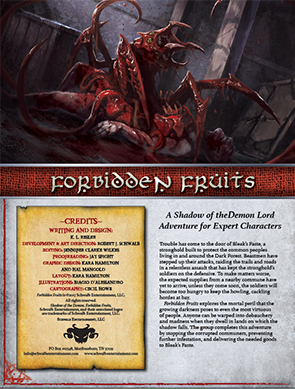 Buy Forbidden Fruits from Schwalb Entertainment or on DriveThruRPG! Small towns and settlements dot the coasts and wilds of the Empire, and the people living in them have learned to eke out a meager existence in what is often a harsh and unforgiving environment. Some people turn to local traditions and faiths to keep them safe, others invent them to suit their needs. One such place is the town of Argron’s Dock, where the locals have taken to worshipping a small god they call The Father. Today is a holy day, a time of great celebration, when the people can give thanks to the Father’s bounty and receive his gifts as they have since they first embraced him as their lord and savior. 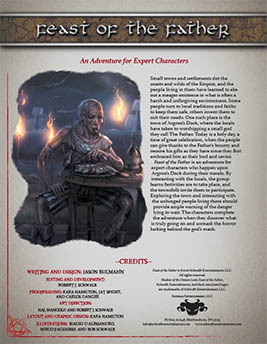 Feast of the Father is an adventure for expert characters who happen upon Argron’s Dock during their travels. By interacting with the locals, the group learns festivities are to take place, and the townsfolk invite them to participate. Exploring the town and interacting with the unhinged people living there should provide ample warning of the danger lying in wait. The characters complete the adventure when they discover what is truly going on and unmask the horror lurking behind the god’s mask. Buy Feast of the Father as a PDF from Schwalb Entertainment or DriveThruRPG!